I try to be an ambassador from the friendly biking nation when I ride. Since throwing a hissy fit or flipping off a driver probably just confirms their existing opinion of people on bikes (since of course we are all 100% identical, unlike those unique individuals behind the wheel), I figure I’m helping a little in our ongoing efforts to build diplomatic relations and perhaps someday be admitted to the WTO (World Transportation Order). This graphic suggests a similar approach. Consider freaking them out. 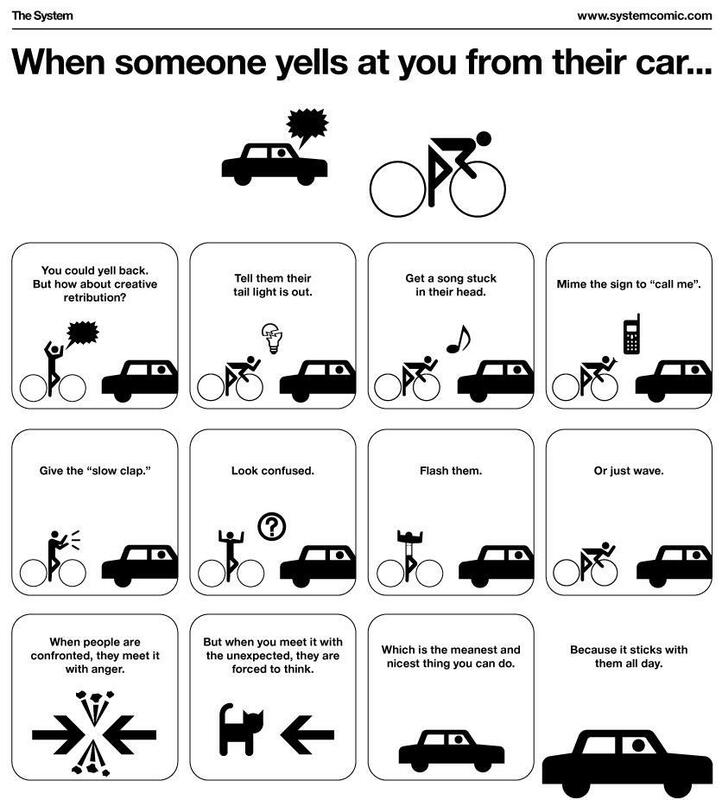 I’m a big fan of the overly-friendly wave and grin, as I utter a stream of profanities under my breath that would peal the paint off their car. This is great. I’ve tried to honk my (non-existent) bike horn at them, which is confusing to me but not noticeable to them. I’ve also shaken my head and said “BAD!” like you would at a puppy you were trying to house-break. Next time it is the Macarena for sure! I lost it at “Flash them”. Bwahahaha! I wonder what signal they think I’m flashing when I wave wearing my lobster-claw gloves–Vulcan peace sign?